Steamed, Noise/Sound Design Sample from Cinematic Tension. 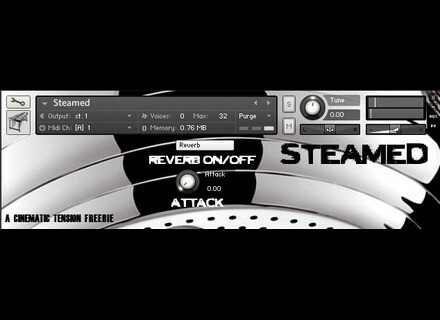 Cinematic Tension has released Steamed, a mallet sample library for Native Instruments Kontakt. Steamed is a metal vegetable steamer with 3 velocity layers, said to have an ethnic vibe to it. Reverb pre-added for added epicness. Reverb may be toggled off via a button on the GUI. Mod wheel controls the attack (along with a knob on the gui) for more dynamic control. Steamed for Kontakt 4.2.3 (full version required) is available to download at no cost. Donations are appreciated. Propellerhead Reason 6 Released Propellerhead Software has announced the release of Reason 6; Reason Essentials, the successor to Record, that packs the recording, editing, effects, instruments, mixing and mastering in a streamlined package; and Balance with Reason Essentials, an audio interface for Mac and Windows integrated with Reason Essentials software.